The Dynapro ATM RF10 delivers aggressive all-terrain driving thanks to its tough pattern, designed to overcome any road. 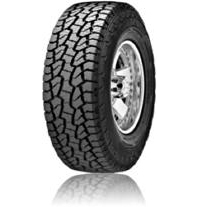 This tyre is optimised to provide performance in all season conditions. Constructed with an optimally wide footprint, this tyre works to retain enhanced contact with the surface of the road, resulting in enhanced gripping and accelerating capabilities. The Dynapro ATM RF10 also achieves enhanced stability on and off-road thanks to its reinforced carcass structure.